What Happens When U.S. Immigration Rules Tighten? Let's Look To Alabama In 2011, Alabama passed what was considered the nation's strictest immigration law. Much of it was later struck down. Now, it offers a snapshot into the challenges ahead for the Trump administration. 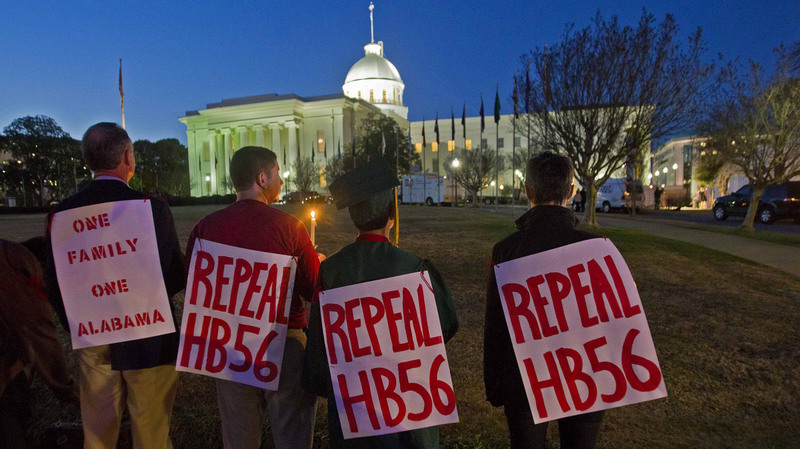 Demonstrators protest Alabama's immigration law at the Capitol in Montgomery, Ala., on Feb. 7, 2012. Much of the law was later struck down. Back in 2011, Alabama passed what was then considered the nation's strictest immigration law. Much of it was later struck down by the courts. Now, the law offers a snapshot of potential challenges ahead for the Trump administration. 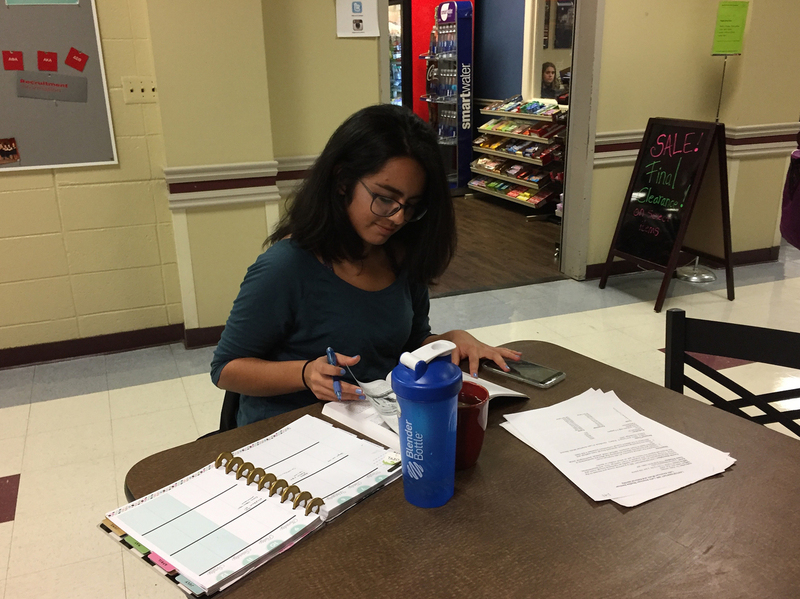 For Fernanda Herrera, a senior at Samford University outside Birmingham, Ala., the current climate surrounding immigration has her scared, just as the Alabama law did in 2011. "I don't know if I'm going to see my parents tomorrow," Herrera says. Her father crossed the Mexican border illegally when she was two. She and her mom flew in months later with visas now expired. Herrera is covered under DACA — deferred action for childhood arrivals — so for now, she likely won't be deported, but she's afraid. "It's supposed to be a happy time. I'm about to graduate from college, the first in my family to do so, and my parents have worked so hard to get me through these four years," she says. "And knowing how detention centers are, and thinking about my parents having to go through that, knowing that my family could be separated, it's just really difficult." Fernanda Herrera, a Samford University senior, says she hopes the U.S. will learn from what Alabama did in 2011 when it had the nation's strictest immigration law. People in Alabama, she says, "fought back and had a lot of that repealed." Her family also feared that in 2011. Alabama had enacted a law that, among other things, nullified contracts — leases, water service, anything — and even made it a crime to give a ride to someone in the country illegally. The law's author said the goal was to attack every aspect of life. Herrera sees something similar happening nationally now, but she hopes the U.S. will learn from Alabama. "They'll see in time that attacking a community is just not the way to have immigration reform happen. Because I mean here in Alabama, we fought back and had a lot of that repealed," she says. Suits by advocacy groups and the Justice Department blocked much of the law, including a requirement that schools check students' immigration status. But that was after farmers' crops rotted and other industries lost labor and business as families fled the state. Jeremy Love, an immigration lawyer, says he's feeling deja vu. "There's a lot of fear going on right now. I've had people say they want to do a phone consultation rather than come to my office because they were afraid of going out of their house," he says. Love predicts mass deportations will hurt the U.S. economy and trigger legal backlash similar to what happened in Alabama. He has more immediate concerns for his clients though. "People are leaving a very dangerous situation in their home country," he says. State Rep. Jack Williams agrees but isn't swayed. The co-sponsor of the 2011 Alabama law thinks values, not necessarily physical danger, should determine who gets to stay. "Today many people are coming to America from very unstable situations," he says. "A hundred years ago, people came to America because they wanted to be Americans." He says his stance against illegal immigration is principle, not personal. "I think there's a richness that we enjoy from the diversity that comes from people coming from around the world, and I'm not opposed or afraid of immigrants," he says. "I just would like to see us follow the law. I think that gives everybody a clear road map on how we should operate as a civil society." If Alabama is any indication, that road map could include hard-to-gauge economic disruption and detours for costly court battles over how immigration laws are enforced.